Carol Black is a long time member of the Cleveland Police Citizens Police Academy Alumni. She is very active in all community events and is a strong supporter of the Cleveland Police Department. A few years ago fellow alumni member Val Addy suggested something should be done at Christmas time to honor our CPD Fallen Officers so Carol Black decided to go with that idea, and boy did she ever! Carol made five sets of laminated ornaments, one for each police district with each CPD Fallen Officer’s name, picture, and end of watch date. So now on each Christmas tree in each police district there are 110 ornaments, dating back to the first fallen officer in 1853. 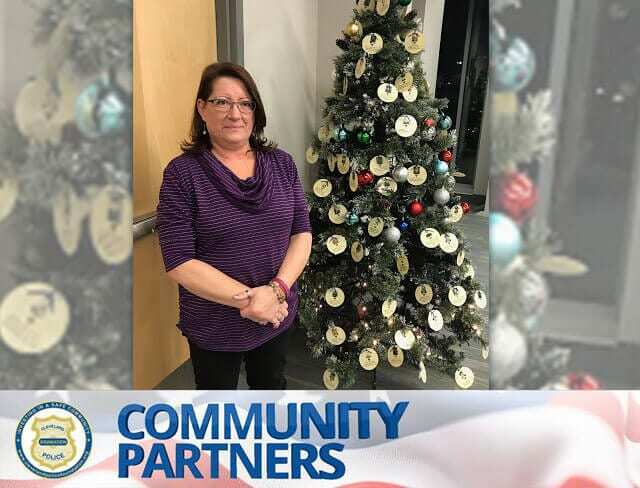 It is because of her dedication and devotion to her community and the Division of Cleveland Police that we name Carol Black the Cleveland Police Foundation Community Partner of the Month for December 2018. Let us all hope and pray that we never have to add another ornament to these trees. 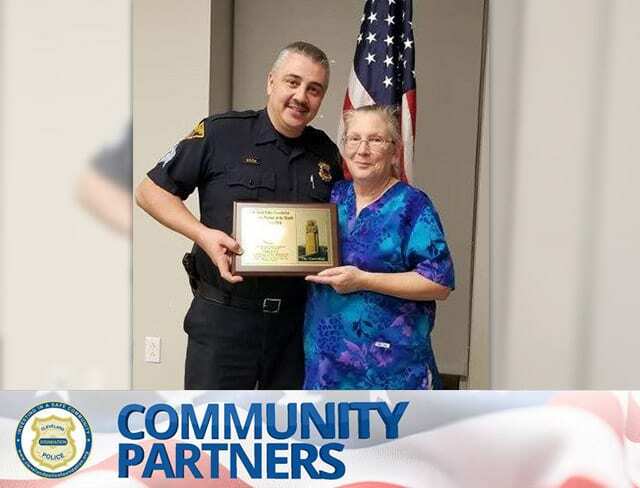 Linda Lewis has been a longtime supporter of the Cleveland Division of Police and has held the position of secretary for the Cleveland Police Citizens Police Academy Alumni Association since 2006. She is also active in her community and is one of the founding members of the Fullerton Road Block Club. So whether it is marching with her group in the Police Memorial Parade or organizing the Alumni’s Summer Picnic and Christmas Party, Linda is always there to make any event a success. 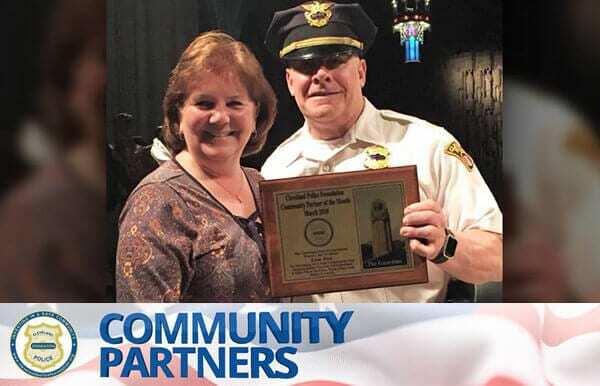 It is because of her devotion and dedication to her community that the Cleveland Police Foundation names Linda Lewis as its Community Partner of the Month for November 2018. In the last five years, Frankie Galizio has hosted and helped organize five of our Cops for Causes Reverse Raffles as well as selling a large portion of the tickets for each event. Proceeds from these raffles go to the outreach efforts of our dedicated Cleveland Police officers throughout the community. These include providing cribs for infants, Christmas presents and parties for struggling families, or donations toward helping those in need. The money donated to our Cops for Kids programs and to the Cleveland Police Foundation has helped us fulfill our mission by creating a better relationship between the police and the community we serve. Our officers truly appreciate the privilege of being able to help a family in need or a resident through tough times. We owe a great deal of thanks to Frank Galizio and all the volunteers from St. Rocco Parish who help us help others! 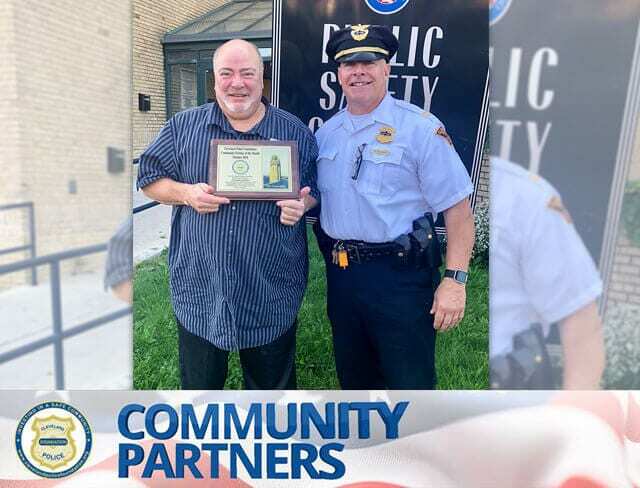 It is because of this unselfish and dedicated effort that the Cleveland Police Foundation names Frank Galizio as its Community Partner of the Month for October 2018. What started as a chance introduction by Ohio City entrepreneur Sam McNulty has turned into an incredible partnership! 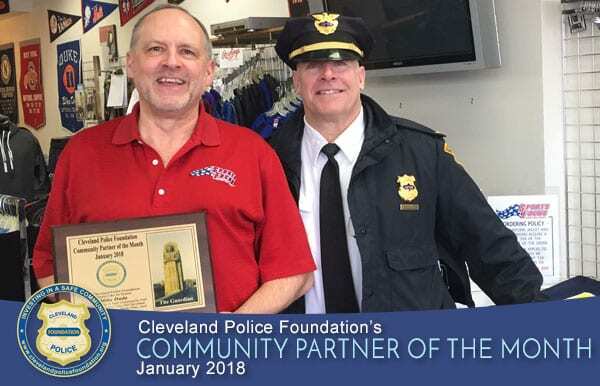 Sam introduced Captain Keith Sulzer, the Cleveland Police Foundation Liaison, to Mark Owens of Skylight Financial Group, knowing that both have a true passion for their Cleveland community. Since that introduction, Skylight Financial Group has taken up the cause of bringing police officers together with the community they serve, most importantly the children of Cleveland. Over the last four years, Skylight Financial Group has donated thousands of new toys to the Cleveland Police Foundation’s Cops for Kids program, providing Christmas presents for literally thousands of needy children and their families. Cops for Kids has received so many toys that we are now able to give out toys all year round to kids at MetroHealth’s Pediatric Unit and simply through Random Acts of Giving. Jeff Zemito of Skylight Financial Group recently received a grant from the Mass Mutual Foundation for $10,000 to go toward our CPF Cops for Kids programs. 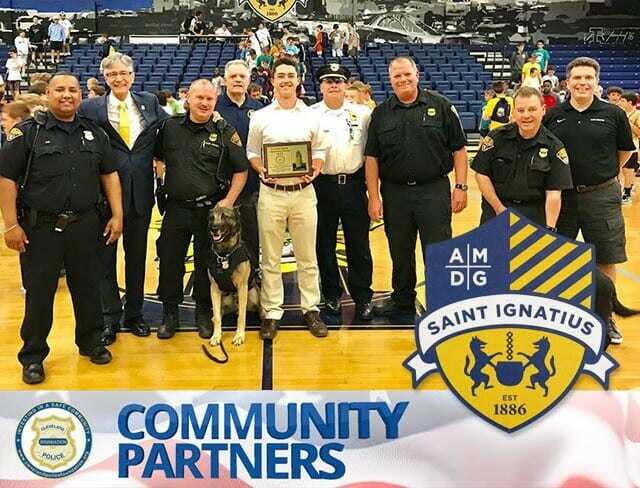 Skylight Financial Group’s Paul Fox, Michael Connole, Dan Brennan, Jeff Zemito, Jonathon Goldston, and Mark Owens, as well as the entire organization, have truly made a difference in our community and we at the Cleveland Police Foundation are incredibly appreciative of their efforts. 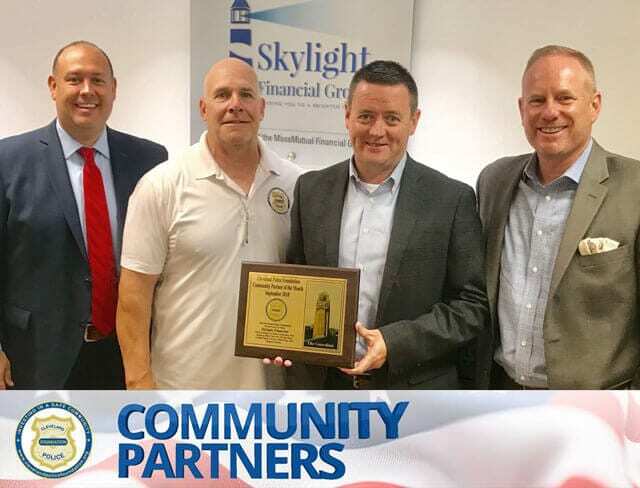 It is because of this effort to assist and provide for the children in the community that the Cleveland Police Foundation names Skylight Financial Group its Community Partner of the Month for September 2018. While travelling to several schools last winter, particularly Thomas Jefferson International Newcomer’s Academy, we noticed many of the children did not have proper school shoes to deal with our winter weather. Many children from refugee families were still in sandals and did not have socks. The Cleveland Police Foundation and Cops for Kids held a fundraiser to help buy school shoes for our CMSD students and raised about $3,000. When seeking out a shoe store that could help us we were fortunate to find our good friend Bridget Pauly from Payless Shoesource at Steelyard Commons. Without hesitation, she jumped at the chance to help us help these children. Bridget and Payless offered us discounted prices and even pitched in to provide each child with a pack of socks, allowing us to buy shoes and socks for 125 children from six schools. We would show up with 20 students and Bridget would single-handedly get each child taken care of politely and efficiently. Due to the money saved from discounts we were able to take each group of kids to Mitchell’s Homemade Ice Cream for a treat after a trip. One young lady who was displaced from Puerto Rico because of hurricane damage remarked that she had no idea school here would be so much fun with the police! 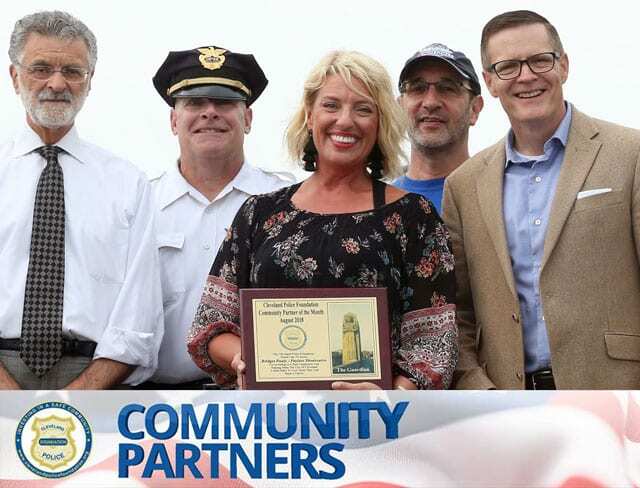 It is because of this going the extra mile for children in need that the Cleveland Police Foundation names Bridget Pauly its Community Partner of the Month for August 2018. The Cleveland Police 1978 GMC High Sierra monster pick-up truck was ready to be scrapped. To the rescue comes the staff and students of Ohio Technical College! They stepped in to do the necessary mechanical and body work on it so the Cleveland Police and Cleveland Police Foundation could use the truck for promotional purposes. The OTC students had an opportunity to be creative in the new design of the truck as well as getting some valuable experience working on a 40-year-old vehicle. They spent many hours and OTC spent thousands of dollars on the project. The new design of the truck has been a huge hit and the CPF and Cleveland Police will be able to use the vehicle to promote their organizations and recruit future officers! 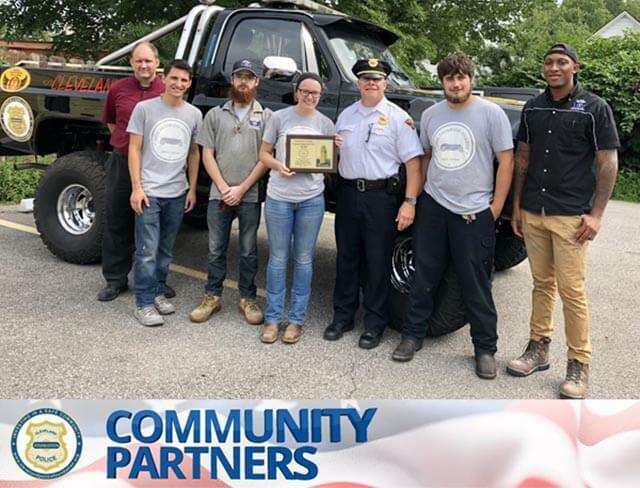 It is because of their generosity and commitment to the City of Cleveland, Cleveland Division of Police, and the entire community that the Cleveland Police Foundation proudly announces that Ohio Technical College is the recipient of the Community Partner of the Month for July 2018. Jennifer Wypasek has been a longtime supporter of the Cleveland Police Foundation, Cleveland Cops for Kids and numerous other law enforcement organizations. Jen is also part of a dedicated team that helps organize our Cops for Kids fundraisers, not only by donating her time but also contributing financially to conduct these important events. As a result of Jen’s participation and devotion to our cause her daughter, Alayah, has also volunteered her time to each fundraiser and has provided excellent suggestions to improve the events. It is because of her incredible commitment to the City of Cleveland, Cleveland Division of Police and the entire community that the Cleveland Police Foundation proudly announces that Jennifer Wypasek is the recipient of the Community Partner of the Month for May 2018. Dan Blazy has been a tremendous partner and advocate for the Cleveland Police Foundation and the community for many years. Dan sells tickets and financially supports the Cleveland Police Foundation’s charitable events. He has pitched in to help us secure our future home of the Derek Owens Memorial Park by placing boulders around the border to keep illegal dumpers off the property. When the West Denison Baseball League’s season was in jeopardy due to the condition of the Thrush Park’s baseball diamonds, Dan volunteered his time and equipment to make the diamonds ready for the kids. Dan has also donated truckloads of pumpkins to Bellaire-Puritas Development for the kids on Halloween. He gives toys, Christmas trees and his time to help with our Second and First District Christmas parties for families and children in need. 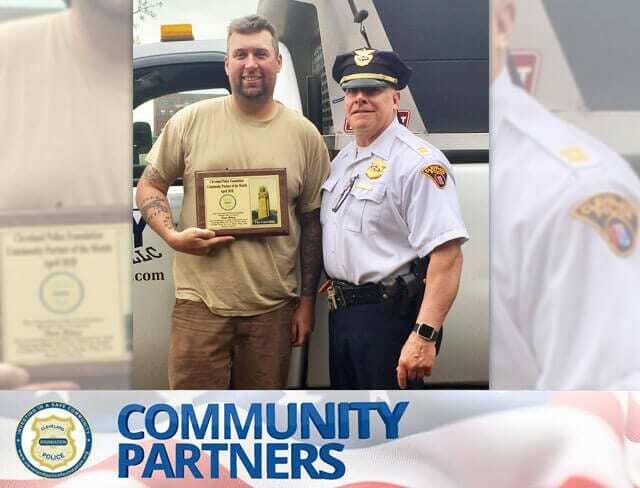 It is because of this dedication and devotion to the community that the Cleveland Police Foundation bestows upon Dan Blazy its Community Partner of the Month for April 2018. When Lisa Fox’s son, Mark Zarefoss, became a Cleveland Police officer, Lisa immediately jumped in to help the Cleveland Police Foundation and Cops for Kids. She has sold countless tickets, donated to our many causes, and has solicited donations and gift baskets for our charity fundraisers. The Cleveland Police Foundation and Cops for Kids needs funds to create positive interactions with our community in order to bridge the gap between the police and the community, and Lisa has been a staunch supporter of our mission. 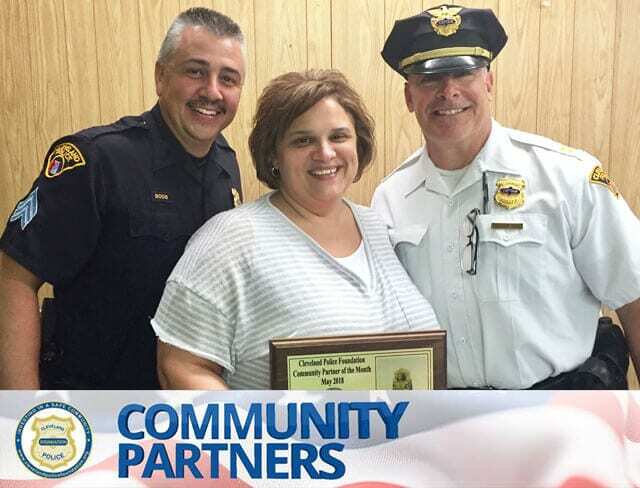 The Cleveland Police Foundation proudly announces that the recipient of our Community Partner of the Month for March 2018 is Lisa Fox. Congratulations Lisa, and thank you for supporting our community! 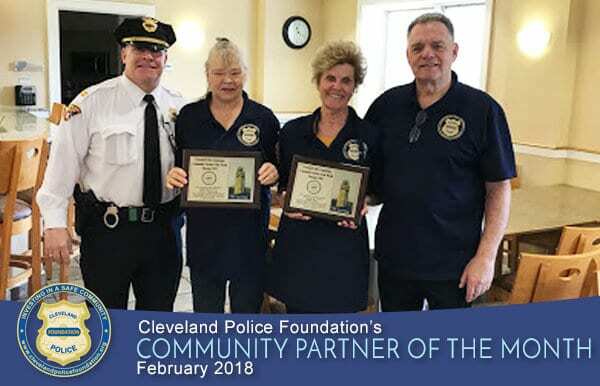 Alice Wegrocki and Rose Roy have been tireless volunteers for the Cleveland Police Foundation for the last four years and are always available to help at a moment’s notice. Whether it is cooking pancakes for senior citizens or grilling hot dogs at community events there is nothing these two devoted individuals won’t do to help bring the police together with the community. Both Alice and Rose make it a point to attend nearly every Cops for Kids event or CPF fundraiser, where their duties include setting up, taking down, and running the event, and they are ever supporting it financially. It is because of the dedication and selflessness of these two individuals that the Cleveland Police Foundation is able to actively fulfill our mission of ensuring safety to our neighborhoods and strengthening the bond between members of the Cleveland Division of Police and the residents they serve. Mike Duda, owner of Sports Focus Sporting Goods, 6659 Pearl Rd. #103, has been an incredible partner and donor to the Cleveland Police Foundation over the last several years. Mike has donated thousands of dollars in new clothing and sports equipment to the Foundation for distribution by Cleveland Police officers throughout the city. This has enabled us to help our recreation centers and local sports leagues with football and baseball equipment and uniforms, and people who are homeless and needy with much appreciated warm winter clothing. Mike provided hundreds of pairs of socks to refugee students at Thomas Jefferson International Academy, many of whom came to this country with little or no cold weather clothing. For his devotion to the community and the CPF we are honored to bestow upon Mike Duda the Community Partner of the Month for January 2018.